Welcome to my blog!!! I’m Damian Garbus, the blog author. 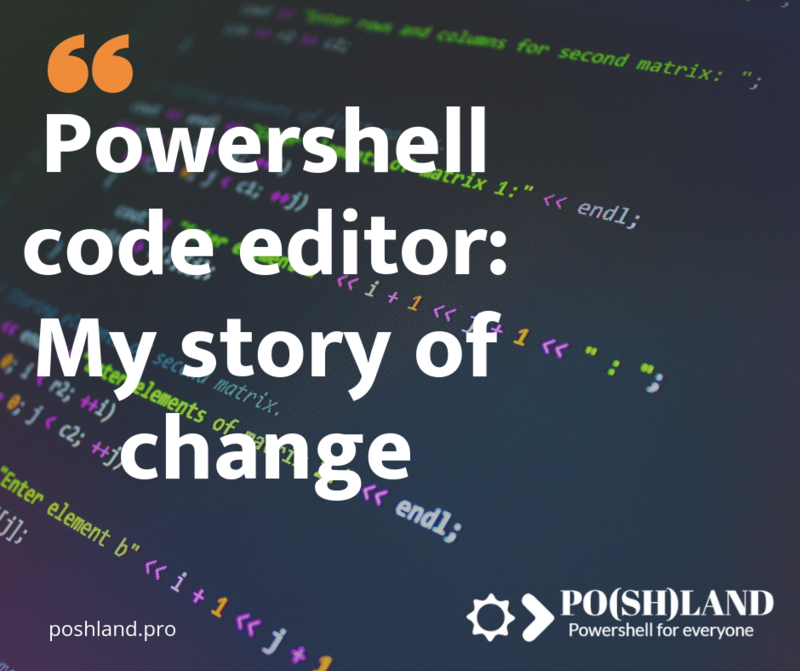 Today I want to tell you about my experience with Powershell code editor I’m using now and editors which I was using in the past. To compare these text editors I will use three functions: syntax highlighting, syntax error handling and GIT extension. I have started working with Powershell to administrate and reporting VmWare vSphere cluster. In that time I was using notepad++. It’s a good basic editor not only for programmers. It supports syntax highlighting for Powershell and many other programming languages. This editor was good for me, but now I don’t recommend it for Powershell beginners because it does not include syntax error handling what is important if someone learns Powershell. After Notepad++, few years I spent writing code in Powershell ISE. It’s default Powershell editor available on all Windows platform. It supports syntax highlighting only for Powershell and helps write the script with syntax hint. It’s basics Powershell editor, but you can extend it by installing Powershell ISE Steroids addon. Powershell ISE supports up to 5.1 version of Powershell and won’t be develope. For 2 years, I have been using Visual Studio Code. This code editor does not support Powershell by default. If you want to develop Powershell script you need to install an extension. It’s open source text editor so you can install it on Windows, Mac or Linux. Visual Studio Code has large extensions database. For example, you can install GIT extension for scripts versioning. The extensions help customize this editor to many other languages than Powershell. For me, it’s the best code editor now. In the end, I want to tell you the one thought. Everyone has different needs. You have to choose the best code editor for you. Visual Studio Code is good for me because I write code in Powershell but also learn C# and Node.JS. If you decided to install Visual Studio Code, please check also how to start writing Powershell scrpts. Please let me know about your code editor and why are you using it.